About 125 people took part in our northeastern B.C. outreach and training events in November. Almost 30 people and 50 people participated in our introductory courses in Prince George and Fort St. John, respectively, to learn about better ways to build. The City of Prince George sent a municipal planner seeking information on how to make the city’s planned fire station Passive House. Passive House modelling software is currently not a recognized modelling tool to demonstrate compliance with the National Energy Code for Canada (NECB). As a consequence, a project is required to complete a second energy model, at additional cost. To address this, a formal submission to the Canadian Commission on Building and Fire Codes is being prepared to consider adoption of Passive House as an alternative compliance path. The objective is to align with the Commission’s Long-Term Strategy for Developing and Implementing More Ambitious Energy Codes. Building a Passive House takes a community, and bringing information about the benefits of high-performance buildings to the design and construction industry requires the support and advocacy of industry partners. Passive House Canada thanks the following companies for exhibiting at the Passive House Pavilion or sponsoring the Passive House Canada events at IIDEX Toronto. VICTORIA – Passive House Canada, the Real Estate Foundation of B.C., the City of Fort St. John, and the West Moberly First Nations invite area residents and builders to Passive House Café, November 30, from 5:30–7:00 pm, at the Fort St. John Passive House, 9904-94 Street, Fort St. John. VICTORIA – Passive House Canada and leaders in Ontario’s construction community present the latest developments in high-performance building at IIDEXCanada, November 29. At the half-day Passive House Summit at IIDEXCanada, Canada’s leading designers, builders and planners of high-performance buildings explore the latest development in buildings policies, high performance–building principles, case studies and future directions. Passive House Café heads north to Prince George, B.C. VICTORIA – Passive House Canada, the Real Estate Foundation of B.C., the Aboriginal Housing Society of Prince George and the West Moberly First Nation invite area residents and construction-industry members to Passive House Café, from 5:30–7:30 pm, November 28, at the Aboriginal Housing Society of Prince George, 1919 – 17 Avenue, Prince George. At this informal event, high-performance building expert Marcel Studer, of Econ Group, and Terry Dunn, of the West Moberly First Nation, share insights into emerging building codes trends in B.C., the benefits of buildings designed to the high-performance Passive House Standard, and opportunities to apply the standard in northern B.C. projects. The Passive House Institute has certified B.C.’s first institutional Passive House building. Okanagan College received certification for its Penticton campus daycare centre October 30, during the Net Positive Symposium in Vancouver. 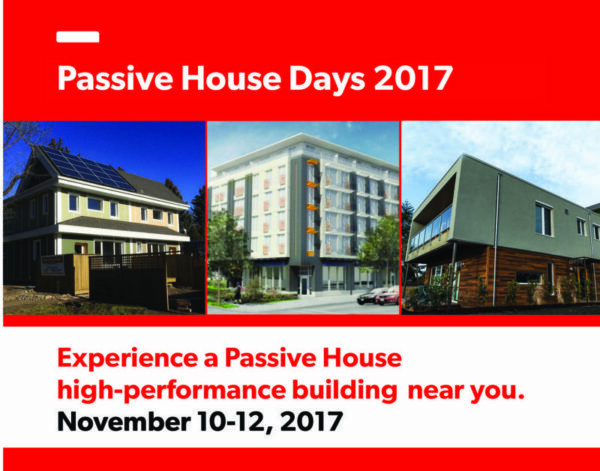 Join your fellow members in spreading the word about the benefits of Passive House to your communities during Passive House Days, November 10-12. Projects in Saskatoon, Vancouver – Burnaby, Victoria, Calgary, Ontario and Quebec have been signed up for site tours, open houses and presentations. Let us know that you’re signing up: we will help you promote your events. Oleksandr (Alex) Yakovenko, the winner of this summer’s Ice Box Challenge Grand Prize, and his guest spent an October day in the Whistler area learning more about Passive House buildings. They joined Mattheo Durfield, of B.C. Passive House, for an excursion to the B.C. Passive House facility in Pemberton, and a drive-by tour of Rainbow House and other Passive House and Passive House–inspired residences in Whistler. At the end of the visit, Karel and Karen Jonkers gave them a royal tour of their magnificent Alta Lake Passive House. Partnership brings high-performance building education to northeastern B.C. VICTORIA – A partnership between industry groups, municipalities and First Nations is bringing outreach and education about high-performance buildings to northeastern B.C. communities. Passive House Canada, the Real Estate Foundation of B.C., the City of Fort St. John, the West Moberly First Nations, and the Aboriginal Housing Society of Prince George have joined forces to provide courses and events for the public and construction industry about the Passive House high-performance building standard to northeastern B.C. communities.